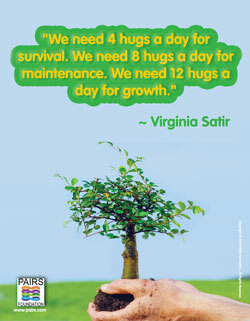 Download graphics of this and many other Virginia Satir quotes at partsofself.pairs.com. This week, we’re celebrating Virginia Satir (1916-1988), a pioneer in the field of marriage and family therapy, who was born June 26, 1916. Virginia Satir served as PAIRS Foundation‘s honorary founding chair when the nonprofit was established 30 years ago. Her work continues to influence leading marriage and relationship skills classes taught throughout the world. Here are some of our favorite Virginia Satir quotes. If you know of other memorable Virginia Satir quotes, please share them by posting feedback on FatherhoodChannel.com. “Put together all the existing families and you have society. It is as simple as that. Whatever kind of training took place in the individual family will be reflected in the kind of society that these families create. “Taste everything, but swallow only what fits. Is Your Marriage Strong Enough? Find Out.